In which of the following technologies have you invested in to date? And if not, where do you intend to invest in the next 24 months? Environmental monitoring technologies have strong penetration rates in the African mining industry, with significant growth expected for drones and wearable technologies, finds a new report by Timetric’s Mining Intelligence Center (MIC). In a survey of more than 100 mine managers and senior decision-makers working in mines throughout Africa, respondents were asked to choose, from a set of 12 mine-site technologies, which fields they have already invested in, and where none were made, the fields they are planning to invest in the next two years. The 12 categories covered a wide range of current technologies such as drones, machine automation, energy management and optimisation, tire monitoring and predictive maintenance. According to the results, considerable shares of mines in Africa have already invested in environmental management, tire monitoring and shift optimisation technologies, with the penetration of eight mine-site technologies expected to exceed 80% within two years. Currently only used by a small share, sharp increases in the use of drones, wearable technologies and real-time video training technologies are expected. Fig. 1 shows that 85% of mines have made investments in environmental monitoring and emissions management. This was followed by some heavy equipment-focused technologies: tire monitoring (80%), scheduling and shift optimisation (79%), fleet management and vehicle monitoring (77%), collision avoidance and proximity detection (75%), and predictive maintenance (75%). While the share of mines with environmental and emissions management is expected to increase, exceeding 90% in two years, this is predicted to be surpassed by scheduling and shift optimisation software as mines strive for yet higher levels of productivity should respondents invest as they have indicated. Companies have identified the cost savings possible through optimising scheduling and haulage, and improving equipment maintenance and operational safety. 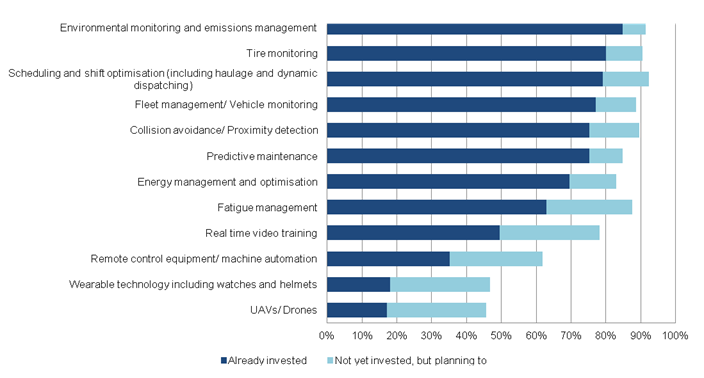 Over the next two years, the biggest shares of respondents who still haven’t invested, but are planning to do so are in drone technology (29%), wearable technologies (29%), and in real-time video training also with 29%. In two years time, should respondents invest as they say they will, a total of 92% of respondents will have implemented on their sites scheduling and shift optimisation technologies, 91% will have implemented environmental monitoring systems, and 90% will have implemented both tire monitoring and collision avoidance and proximity detection technologies in their operations. “As pressure from depressed commodity prices continues to affect mining companies, the speed at which new technologies are taken up on site would be vital for success in the industry. Current investments have clearly been geared towards improving heavy equipment utilisation, but it is comforting to know that African miners have considered environmental responsibility to be crucial for success alongside production figures,” comments Nez Guevara, Senior Mining Analyst at Timetric’s MIC.